A couple of months ago, my friend sent me one of the devotion books that she wrote. I let it sit, untouched, on my bedroom dresser. It had a happy cover and I liked the look of it for decoration. I knew it was meant to be used, though, so the guilt kind of gnawed at me to crack it open. Why? I don’t know. It’s a devotion book for pity’s sake. It doesn’t require fifty pages be read in a night, it doesn’t really require anything of me, but to soak it in. Emily is a beautiful writer, with precious words that feel like lotion on your heart in the dry season. Knowing that, I still let the book sit. Some unseen force kept me from reading even page one. And then I did. Getting dressed one morning I opened the undisturbed spine and began to read. The first devotion spoke exactly to the turmoil in my home and my heart as a mother. It talked about children and their many and incessant needs that can’t be helped, Emily spoke with vulnerability and honesty about shouting and brimming over with frustration, followed by a plea for God to work in her weakness and a reminder of His mercy flowing over into our day. These statements, what I have felt for so long – the fear of what my children needed and what I couldn’t provide for them. I saw it laid out and put into words, followed by words of grace and the knowledge that Christ’s mercy covers even this. Christ’s love fills my gaps. These are the words Satan didn’t want me to read. He wanted me to look at the pretty cover, enjoy the book on my dresser…anything but read about forgiveness and mercy and grace. Then I dug down into another layer of truth. Knowing that as someone who ministers to women every day, I get thwarted trying to open a devotion book, I wondered how I could help other women get past that unseen force keeping the book closed, the bookshelf full, the heart still in need of the Word? Why do I fill my bookshelf with devotions and Bible studies read once in their time and then to gather dust? I’m going to pass them on. 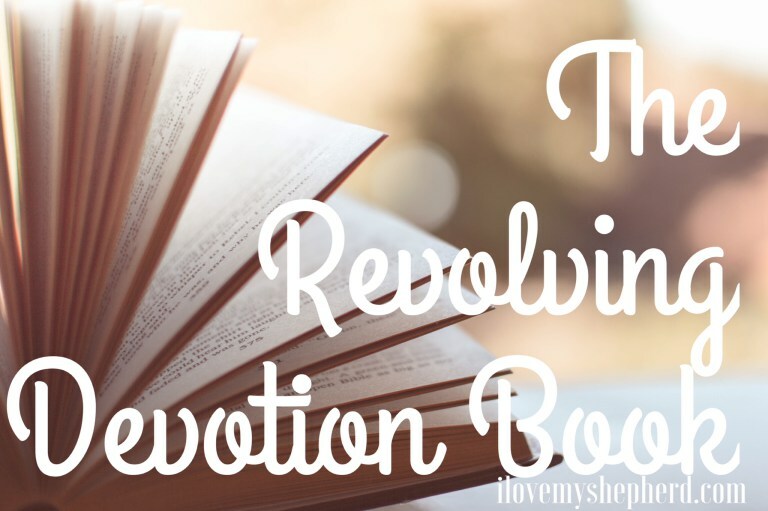 I’ve decided to create the revolving devotion book. I take a book that is new, or one passed on to me from a friend. I pass it along to another friend. They pass it to their own friend. The book gets passed on from friend to friend with a lot of love and a wee bit of accountability. I wrote my name on the inside of the cover. I don’t expect the book back, but I want others that receive it to see and be encouraged by the list of women that are in this life together. We are all trying to do this woman thing, this family thing, this Jesus thing, the best we can. We need to rest in a whole lot of mercy and grace. I’m could create conversation. She’ll pass it on to some friend un-known to me, but a fellow sojourner all the same. She’ll create conversation too. His Word will be shared. Compassion and grace will go out. It’s not about me or my system, but it is about fighting past the things that keep us from His Word, His forgiveness, and keep us in the isolation battle, hiding in shame and sinking in failure, and wishing for another life. Maybe you’ve been there, with the devotion sitting unread on your dresser. Maybe you have a book and a friend to pass it on to. Let His word sooth your soul and connect you to His people. May He fill you with His new mercies every morning and care for you, as you care for one another.